Hello everyone! Today I’d like to introduce you to Subak Soju, a very popular cocktail in Korean bars in America that you can easily make at home. It’s made with soju, which is the #1 distilled beverage in Korea but not well known to the rest of the world. If you can’t find it in a Koreatown near you, you can substitute it with vodka. The fun thing about subak soju is that you can use the blended flesh of the watermelon to make your drink and use the watermelon shell to serve it in — nothing is wasted! The first time I ever tried something like this was at one of my favorite Korean bars in Manhattan, Pocha 32. They make it from half of a large watermelon that everyone at the table can share together, not with small watermelons like I do in this video. Whichever method you use, the ratio of soju to blended watermelon is 1:1. 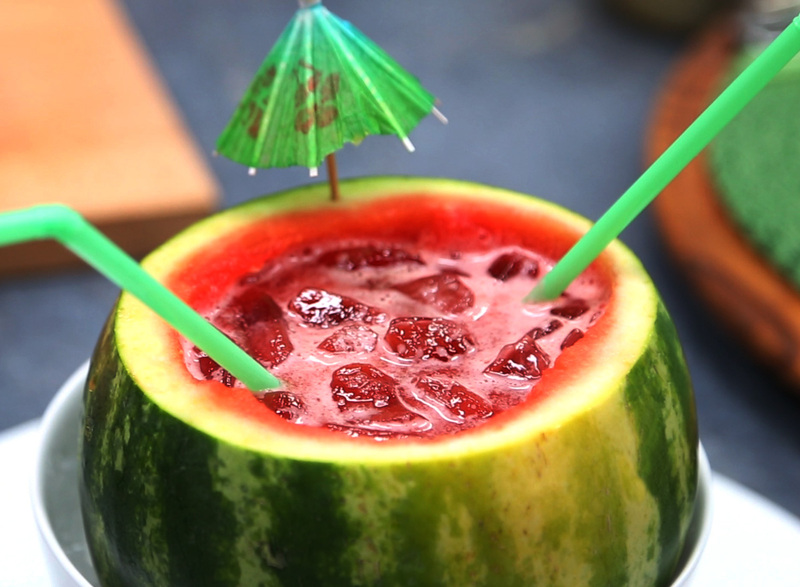 People love the floating ice and the delicious watermelon in this drink – it’s sweet, cold, and very refreshing. But be careful! It tastes very fruity but there’s a lot of alcohol inside! This video was filmed at the Tastemade kitchen studios in Los Angeles with Hilah of Hilahcooking. Jimmy Wong of Feast of Fiction also stopped by for a drink. Check out their channels and subscribe to them, they are all pretty cool. Cut off the top of watermelon. Scoop the flesh out with a spoon and put it in a blender. 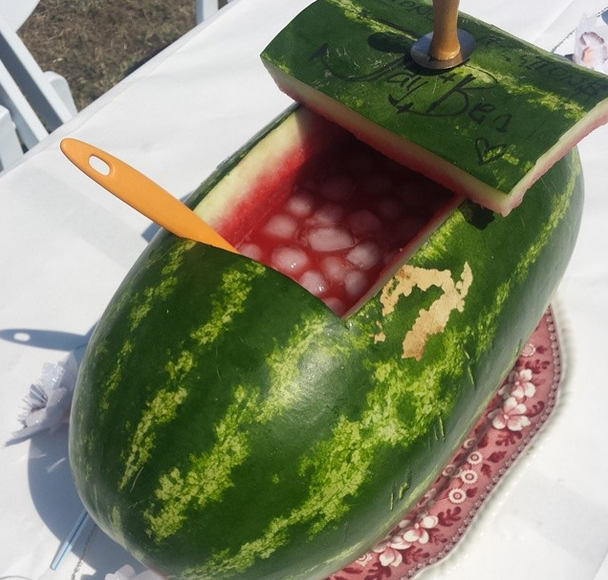 Set aside the watermelon bowls. Blend the watermelon flesh for 1 minute, until smooth. 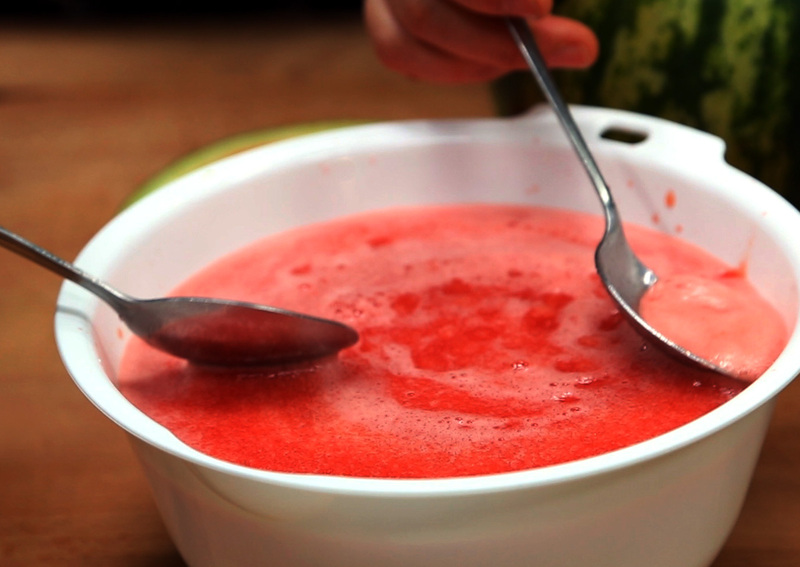 Set a fine-mesh strainer over a bowl and pour the blended watermelon through it. Press down with a spoon to strain it well. Discard the pulp. Remove the foam from the top with a spoon. Measure 4 cups of blended watermelon juice and put it into a pitcher. Add 4 cups of soju and mix well. 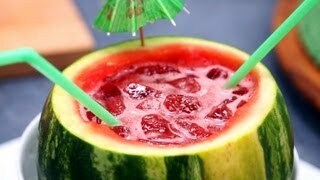 Pour the mixture into the watermelon bowl and add ice cubes. Serve cold with a green onion pancake. Posted on Saturday, September 14th, 2013 at 3:19 pm. Last updated on April 26, 2015. Posted May 19th, 2017 at 5:35 pm | Log in to reply. How far in advance can I make this cocktail? Will it sit (without ice cubes) in the fridge for 2 hours or more before it’s consumed without its flavor being affected? THANKS! Posted August 4th, 2014 at 8:28 am | Log in to reply. Hi Maangchi! Thank you for this video. I made this for my engagement party yesterday, you can have a look at the photo here! I love your channel! I’m a korean born and raised in London – My 엄마 loves your show too! Posted August 4th, 2014 at 5:34 pm | Log in to reply. Where is the photo, Jay? I think I saw the link, but disappeared suddenly. Anyway, congratulations on your engagement! I’m so honored to hear that you made this on your special day! Posted August 19th, 2014 at 12:34 pm | Log in to reply. Posted July 8th, 2014 at 4:18 pm | Log in to reply. What can you use as a substitute of the soju? Is there such thing as a cheonyeo subag soju? Posted September 15th, 2013 at 12:17 am | Log in to reply. I am totally going to make this for the next party! I’m Korean from Korea and started to cook Korean food less and less living in California. After I found your web site I started to make more Korean foods using your recipes. They are great! I’m having a girls night next Saturday and going to make Kongnamulbab, fried chicken gizzards and this subak soju!!! Love you, Maangchi!!! Posted September 15th, 2013 at 9:18 am | Log in to reply. “Kongnamulbab, fried chicken gizzards and this subak soju!” that’s a good choice! Posted September 19th, 2013 at 6:04 pm | Log in to reply. Thanks, Maangchi! I already tried making Kongnamulbab and fried chicken gizzards using your recipes and they are awesome!!! Can’t wait to post the pictures after the party. Posted September 14th, 2013 at 11:23 pm | Log in to reply. Posted September 15th, 2013 at 9:15 am | Log in to reply. yes you need people to share with it! : ) Good luck with your subak soju party! Take some photos to show us! This recipe was originally posted on September 14, 2013 at 3:19 pm by Maangchi. It was last updated on April 26, 2015. The video was watched 2,731,125 times on YouTube & has 12,509 likes!